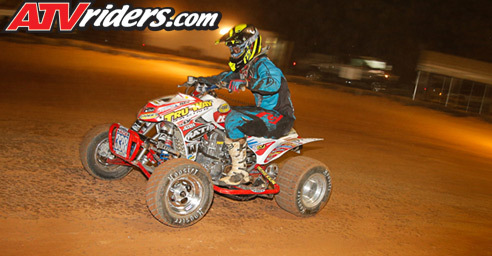 Wadesboro, NC – After an exciting opening round of the 2015 AMA Extreme Dirt Track ATV Racing series on Friday May 29th at Perimeter Park Motorsports track, racers returned to the track on Saturday for the second round of the double header weekend, and once Again, Two Se7en Motorsport’s Brad Riley was unstoppable as he charged his to the front in both the Pro and Pro-Am classes for a solid start to the season. WISECO / RAGE / Elka Suspension’s Chuckie Creech finished right behind Riley in both races in the second spot. 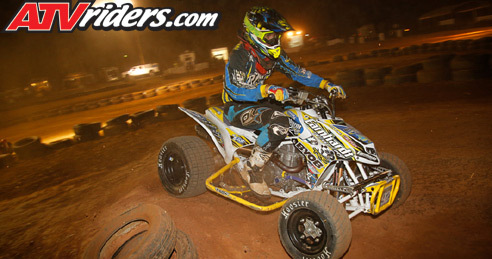 Finally, Brian Ace scored three podium finishes on the weekend with a third place finish in the pro class. It was another picture perfect day for racing for Round 2 with nearing ninety degrees with sunny skies, and MAXXIS / PEP / Houser Racing’s Brad Riley was ready to shine as he came out of the holeshot in third place behind Brian Ace who grabbed the holeshot after the red-flag restart because a rider jumped the start. Riley hammered on the throttle and pressured the pair of Ace and Creech up front until one of them slipped into a mistake or opened up a sliver of a spot, so Riley could sneak around them. As soon as he saw this opportunity, he pounced on it and was able to get around Ace who had been battling with Creech for the early part of the race. With Riley being behind Creech for several laps, he was able to study his movements and lines and also put a pass on Creech shortly after passing Ace. Once out front, Riley stayed true to his talents and remained on the gas to complete the twenty lap race in first place, his third first-place finish of the weekend! “I spun the tires a bit off from the start and came off third place, I got behind Ace for a few laps and then slowly reeled in Chuckie and battled it out for several laps and I put a few different moves on him that didn’t work and found a few ways of passing him and finally made it stick. I got a little bit of a lead and held that all the way to the finish line. Tonight’s track was a bit more race-ready than last night and was a lot of fun to run on. The big berm seemed to be one of my best spots for improving my position, but I tried every single part of the track for the pass. Luckily I got out front and was able to hold onto first place and I’m happy with that,” said Riley. 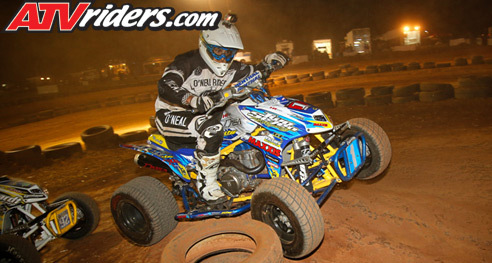 CCR Swaybars / WISECO / Houser Racing’s Chuckie Creech got off to an even better start than Riley and was the first on the scene to contend with Brian Ace, the holeshot winner. Creech applied strong pressure early on in the race and was able to catch Ace in a corner and make the pass and move into first place. Creech’s race wasn’t over however as he had about three quarters of the race left to run and had Riley slowly moving in on his rear grab bar as well. Once Riley got around Ace as well, the race was on and Creech came under heavy pressure. Unfortunately for Creech, he got bumped back to second place as Riley moved his way to the front of the pack. 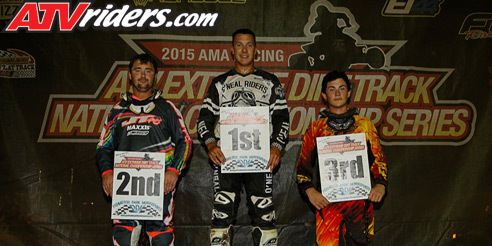 Creech settled for second place on the Pro podium but was happy with a solid weekend and a good start to his season. 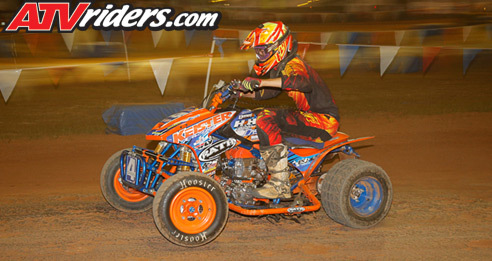 “The RAGE motor, Elka suspension and MAXXIS Tires really got me out front. Ace was holding a really good line and I wanted to get out front and trying to do my best and they were running a great race. I got up there and did what I could, but Brad ended up getting around Ace and then got around me eventually. I really messed up bad a couple of times, and I knew he was there and he’s not gonna ride behind you, and he’s always gonna make a move on you. You always see stuff you could of done after the race but we just need to move forward from here and keep going,” said Creech on the podium. Tru-Way Racing / Walsh Racecraft / PEP’s Brian Ace hammered the throttle on his Tru-Way racing engine immediately upon the restart and seeing the green light become energized and ripped the holeshot during the Pro main. Ace remained steadfast through the first few laps of the race even under pressure from Creech and Riley. However, Ace eventually was passed by both Creech and then Riley before the twenty laps were up and was forced to settled for a third place, his third podium of the weekend. Earnhardt Racing / TRE’s Michael Houghton and Wolff Motorsports / Hoosier’s Nathan Wolff were duking it out for fourth and fifth place behind Ace and ended up in those positions at the end of the race, Houghton in fourth and Wolff rounding out the top five. The Pro-Am class was also a great race to watch and with only six riders in the class for round two, it was face-paced and the action unfolded quickly! Two Se7en Motorsports / Victory Motorsports / SSi Decals / Motul’s Brad Riley came off the line in third place during the Pro-Am main holeshot behind Garrett Keister and Chuckie Creech who was the holeshot winner. Riley fought to get around Keister for the first several laps, trying different moves and finally one stuck for him. Once around Keister, Riley took on the task of chasing down Creech who, by this time, had a decent lead out front. This lead was nothing Riley was worried about however as he went into overdrive mode and caught back up to Creech and began working his magic on him to make a pass. The third time was a charm for Riley as he tried the same pass on Creech around the big berm corner, failing the first two times and finally getting around him on the third. After the pass, Riley stayed on the throttle and remained out front until the checkered flag flew resulting in his fourth first-place finish of the weekend. He now definitively sits in first place in both classes heading into round three. 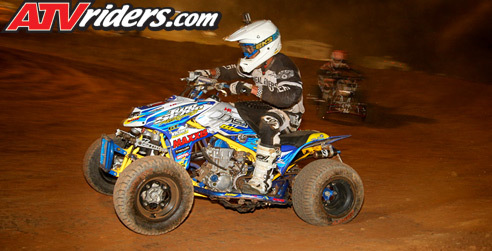 WISECO / RAGE / Elka Suspension’s Chuckie Creech pulled a big holeshot and began to tick away the laps of the fifteen-lap race. Using Keister as a spacer between himself and Riley, Creech got as big of a gap as he could before Riley could make up any ground on him. 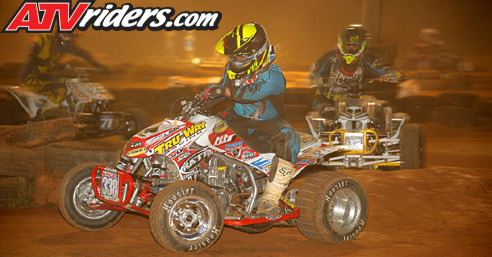 Creech stayed on the gas as Riley inched closer and battled back and forth several times rubbing past each other at high speeds before pitching their TRX450R’s sideways into the tight left-hand one eighty. It was at this section of the track that Riley was finally able to slide by Creech to take over the lead before the end of the race. 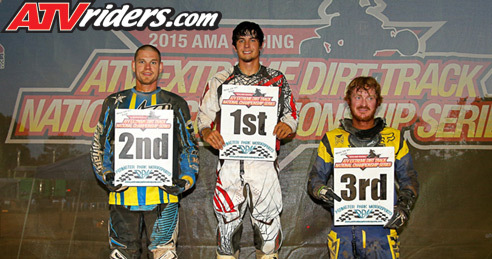 Creech settled for a second place finish, once again, gaining a great start to his season. 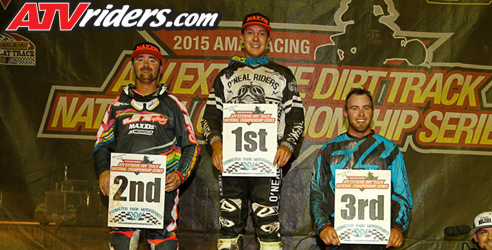 H&H Extreme / FLY Racing / RATH Racing’s Garret Keister got on the podium for the first time in 2015 and had a great battle on his hands going up against Creech and Riley upon the holeshot and coming out in second place. Keister trailed Creech closely but was having to fend off attacks from Riley the whole while. Eventually Riley got around Keister, bumping him back to third place. Keister remained in this position for the rest of the main event, rounding out the Pro-Am podium in third place. 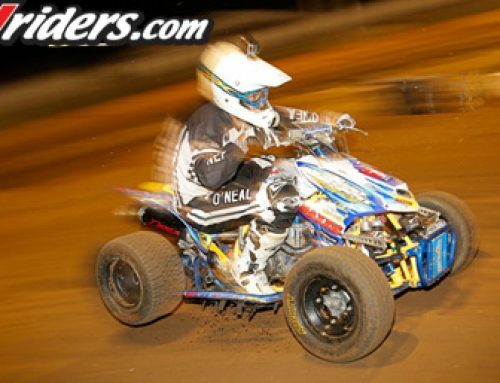 The Pro-Am unlimited class had one less racer than the Pro class and with the opportunity to run a bigger engine or modified ATV, the racing action would be fast and furious! Big Dawg / B&B Motorsports / Canup Trucking’s Aaron Medlin came out of the Pro-Am Unlimited holeshot in second place, he was not happy with this position however. Medlin cranked on the throttle cable to his Advanced Carbs powered TRX450R and began to pressure Michael Houghton heavily as the pair charge away from the pack behind them. Medlin continued to use the big berm in the middle of the track to his advantage and as the pair round the corner into vision it was Medlin who was in the lead. Medlin remained basically without pressure for the rest of the race as Wolff and Houghton battled behind him allowing him to skate away with the lead and the win, one of his first big wins of his young pro career. 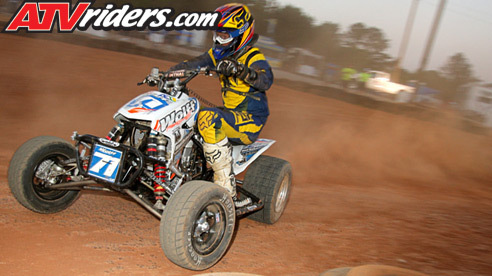 Earnhardt Racing / FOX Shox / FTi’s Michael Houghton snagged the holeshot with this TRE racing engine powered TRX450R and continued out onto the dry and dusty course in the lead. Houghton soon came under fire from Medlin who was on a mission to the front of the pack. Houghton slipped back to Medlin in the earlier part of the race and then battled the course as he held off advanced from Wolff who was coming up quickly. Fortunately for Houghton, he was able to hold on and take a second place finish after the fifteen-lap race. 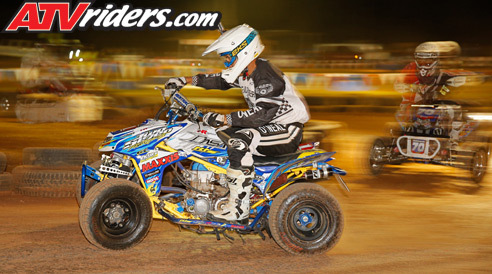 Maul-Tech ATV / Hoosier / DASA’s Nathan Wolff Got a mid-pack start in around seventh place out of the holeshot but did not waste much time improving his position quickly. Wolff was up into a podium-contending position within only a few short laps and was able to move into third place by the time the checkered flag flew. Wolff’s third place position combined with his podium from the preview day now has him in a great position heading into the third round of the series as well. CJ Robson had another great run for himself for round two and was battling it out with Josh Hibdon of H&H Extreme. Hibdon couldn’t quite get the drive he wanted and rounded out the top five with Robson taking fourth place. 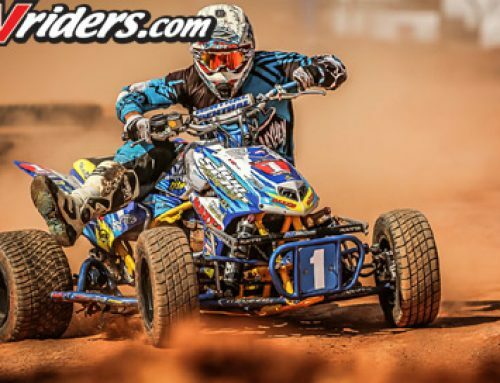 The next rounds of the Extreme Dirt Track ATV racing series is scheduled to be at another brand-new race track at the Shelbeyville Fairgrounds in Shelbeyville, Indiana on, Father’s Day weekend, June 19-20th! This is also a double-header race and should be very exciting!